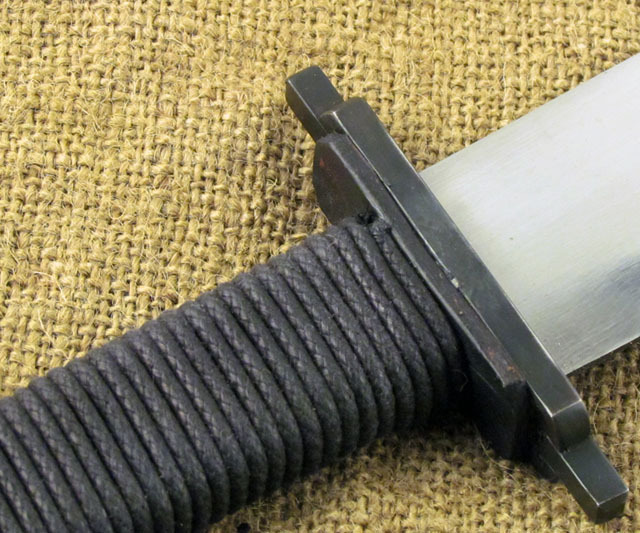 The many types of short swords have origins from almost everywhere in the old world. Indonesia has an amazing variety of big knives and short swords. The Indian region and Africa offer some of the more unusual types. Asia has a number of entries into the category, while Europe offers the small sword and the gladius, among others. I think the gladius is probably the closest thing to what we, as gamers, think of as a short sword: the classic old-school thief’s weapon, designed for fast cut-and-thrust melee in tight spaces. The sword I’m about to present to you is a hybrid of several types, with some unusual design modifications. My intention was to forge a cut-and-thrust short sword, but one that is heavier-bladed and designed for bigger hits, while maintaining the ability to thrust. I needed to first choose the type of steel best suited to the job, then design the blade profile and edge geometry. First things first. And the first thing that has to be decided is what type of steel is the best choice for the design and its intended purpose. You’ll recall from Real Steel: Steel Types and Properties that there are many types of steel, each with its own strengths and weaknesses. Since I wanted this to be a hard hitter, my choice is 5160. It’s capable of a combination of hardness and toughness that’s hard to match. I often choose this steel for choppers, swords, hatchets, and axes. The blade profile is the shape of the blade as seen from the side. I wanted a heavy, chopping blade capable of taking a lot of abuse. I went with a slight curve, so that it can chop and slash, and a point, but not so acute that the tip is fragile. 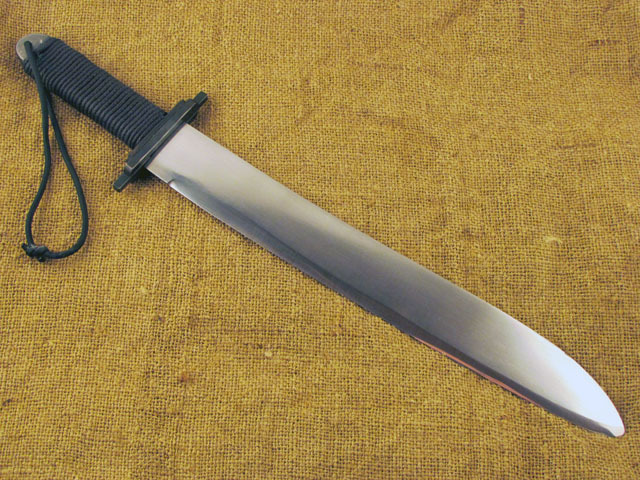 This sword is essentially a hybrid seax/cutlass. We went into some depth about geometry in Real Steel: Edge Geometry, so I won’t go over all of it again here. The best choice of geometry for a blade expected to hold up when smashing armor is convex. The convex edge isn’t capable of great sharpness, but is backed by a lot of steel and is damage resistant. I didn’t cover one aspect of blade geometry in that previous Real Steel, so let’s talk about it now: distal taper. 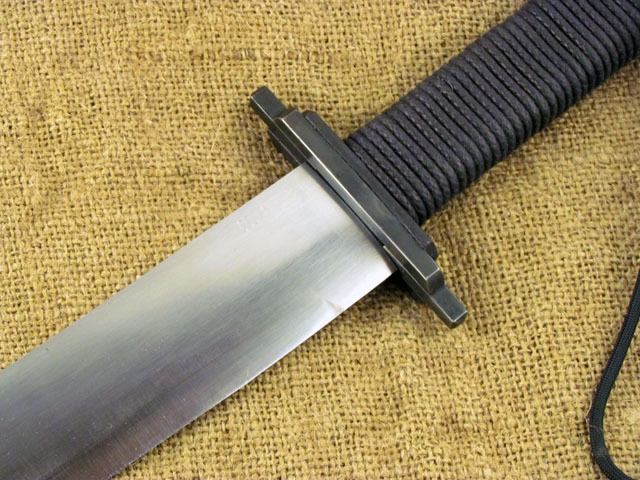 A well-balanced, light, and fast-handling blade will often have a taper running from just atop the guard to the tip. If it’s a full tang, it may also taper from the same spot to the base of the tang. This leaves the thickest part of the blade at or near the ricasso. In a forged blade, it’s fairly easy to create a distal taper as part of the forging process. In fact, it’s hard to not do it. If the blade is made by grinding, the taper has to deliberately be made. This sword doesn’t have much of a taper because I wanted it to be blade heavy and very strong, rather than light and fast. See the compromises? There are always compromises. I’m not sure if we’ve talked about the term “hilt” before. Many people think it means “grip,” but in fact it’s everything from the guard down. So it’s the guard, the grip, and the pommel. This sword has a cold blued, mild steel guard that was fabricated from four pieces that were MIG welded to each other and to the tang. The full tang handle has a leather overlay and cotton cord wrap. The pommel consists of two pieces of cold blued, mild steel that are also MIG welded to the tang. 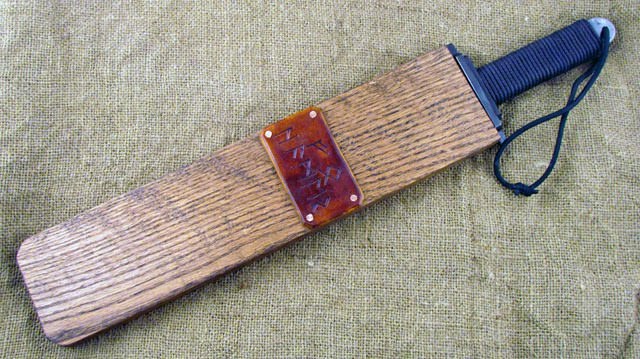 The sheath is made from white oak. It is intended for safe storage rather than carry, and it has a rare earth magnet for retention. 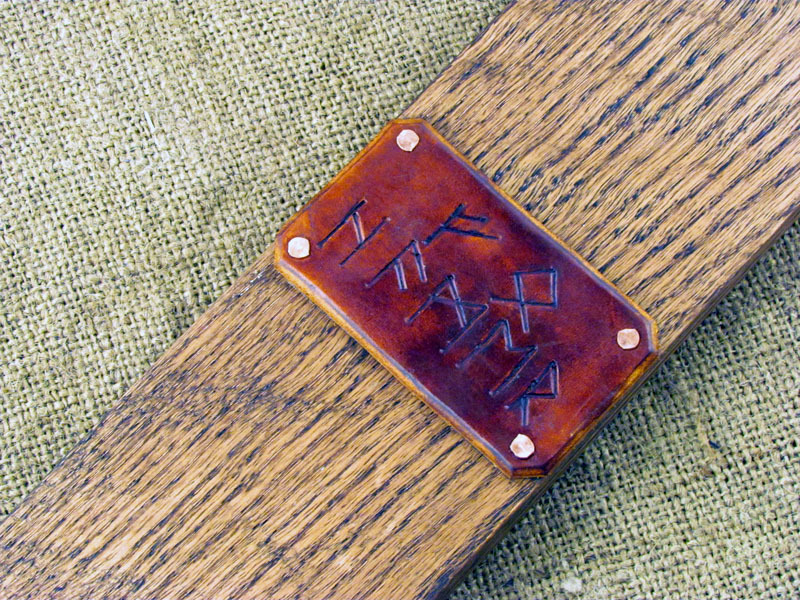 The Elder Futhark runes in the leather say “Foe Hammer” (I can’t help it. I’m a geek.). As always, I’m here for questions and comments. Can you tell us how long it is and why you choose that length? @Travis Knight – Total length is about 22 inches. I chose that length because this is pretty typical for a short sword. 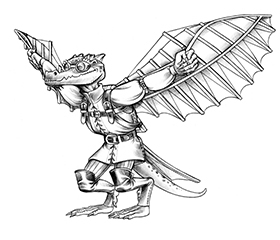 Some of the historical “why” is that it has greater reach than a knife, but is easier handle effectively than a full length sword; a longsword, or rapier, for example. It’s also more easily wielded in tight spaces. It’s a good comprise. Another historical reason for a shorter length sword is the limitations of bronze. 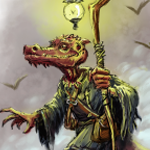 A bronze longsword just isn’t up for the high impact that it would be subjected to. There are some historical examples, but they’re rare. Being built for mass and not speed, what does this weigh? @Thorr-kan – YES! And more on the way! I don’t have it in hand, but if I recall correctly it’s a bit over two pounds. Pretty heavy for a short sword. Doesn’t sound heavy until you’ve swung it around for a few minutes, does it? @Thorr-kan – Yup. I’ve handled a variety of longswords that weigh less. This one handles like a cross between a gladius and a 2# forging hammer. However, the guard is very small. I think I would like some more protection, because it is hard to swing a sword with no fingers. The guard extends a full 1.25″ on each side, and is a total of 4″ across. That’s actually a fairly large guard. Perhaps the width of the blade (1.5″) makes it appear smaller?